The moment you step into the sumptuous Waldorf Astoria, you know you have arrived at a true mountain adventure resort. 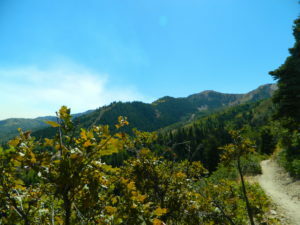 Nestled in the spectacular Wasatch mountains and in the heart of the Canyons/Park City ski resort, this is the address. A short 25-minute ride effortlessly deposits you into mountain happiness. 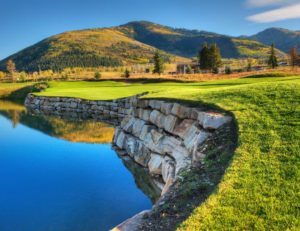 The Park City area is the largest ski and golf resort in the US. 7300 acres of terrain and over 300 trails are at your doorstep with access from the Frostwood gondola. 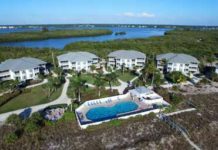 The resort is large, but has a warm, elegant and inviting vibe. The lavish lobby is the perfect place to relax by the fireplaces, gaze out to the stunning pool area or just contemplate your next adventure. The 160 guestrooms have high end, custom furnishings and fantastic views of the pool and onto the slopes. Our suite was a home away from home, with 2 fireplaces, 2 stunning bathrooms, and a wonderful kitchen fully equipped with Viking appliances. It was hard to leave the room after a day of exploration, but, we managed to leave the lap of luxury. The resort has an excellent personal concierge team, eager to assist in a custom adventure plan suited to any taste level for vacation fun. There is also a luxury fitness center and a dedicated gondola to take you to the Park City base in winter season. The restaurant, Powder is high end, on point and perfect for any meal or light repast. 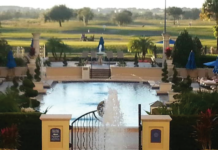 The gorgeous pool area is open year-round, and the spa is a 16,000 sq. ft haven of bliss. 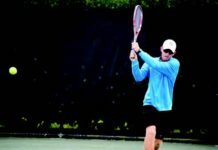 It is dedicated to the balance of mind, body and spirit with a personalized well being program. 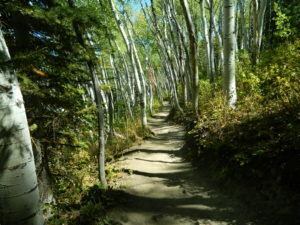 The mountains were beckoning, so we took the recommendations of the concierge and headed to the trails near the hotel. The views were incredible, one better that the next. Being from Florida, the altitude was a good workout when climbing up- but the downhill was fun and a big relief from the climb! There are so many hiking options- many trails can be accessed by the chair lifts (very fun) or the gondolas. You can also try out the trails mountain biking or use the tamer trails that are paved to ride into Park City and the surrounding areas. They also have electric bikes that give you the assist needed to make it up the hills. The days were just incredible, the weather was perfect- sunny, 70’s and cooler at night. Coming from a long, hot summer in Florida, it was just glorious. Some of the locals mentioned they thought it was hot, but that was hardly the case from a southern standpoint! On the heels of a historic $50 million investment in 2015 for Park City resort, there are plans for another significant investment that will enhance the mountain experience. This three-part investment will debut during the 2018-19 winter season and showcases the premier family ski and snowboard experience, to be the top Ski and Snowboard School in the state and to be the definitive choice for signature on-mountain culinary excellence that complements the vibrant food scene in town. Park City was incorporated as a city in 1884. The mountains’ abundant silver veins attracted adventurers from around the world in the late 1860s. During Park City’s mining height, the surrounding mountains yielded $400 million in silver and created 23 millionaires—including the father of newspaper publisher William Randolph Hearst. However, with falling mineral prices in the 1930s, the boom years ended and residents began “mining” a new treasure on the mountain, discovering what would later be coined The Greatest Snow on Earth. Today, Park City is a unique blend of the old and new. 64 of Park City’s buildings are listed on the National Register of Historic Places, many of which are located along the town’s Main Street, and more than 1,200 miles of tunnels wind through the surrounding mountains as remnants of the mining era. 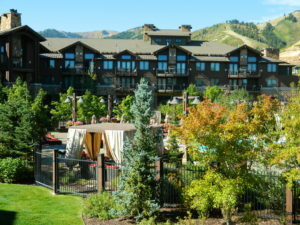 The Waldorf Astoria Park City has received numerous awards and accolades. Notably the Forbes Travel Guide 4-star award from 2012-2018! Additionally, Travel and Leisure awarded the resort in the World’s Best Hotel category in 2014 and 2015. A world of its own, the Waldorf Astoria Park City is a haven of taste, luxury, refinement and adventure. Something that would be reminiscent of the Adventurer’s Club of old from New York- where Sinclair Lewis would have felt right at home.